From 2nd-12th December 2017 I co-facilitated a CERES Global tour to India, themed around sustainable development, permanent culture and un-learning. My focus for the tour was to collect data for my research project on permaculture as a transnational social movement and to learn more about alternative education models as a teaching and learning professional development immersion. This posting is one of a series of my daily reflections from the tour on what our group encountered. Looking down on Dharavi from above. 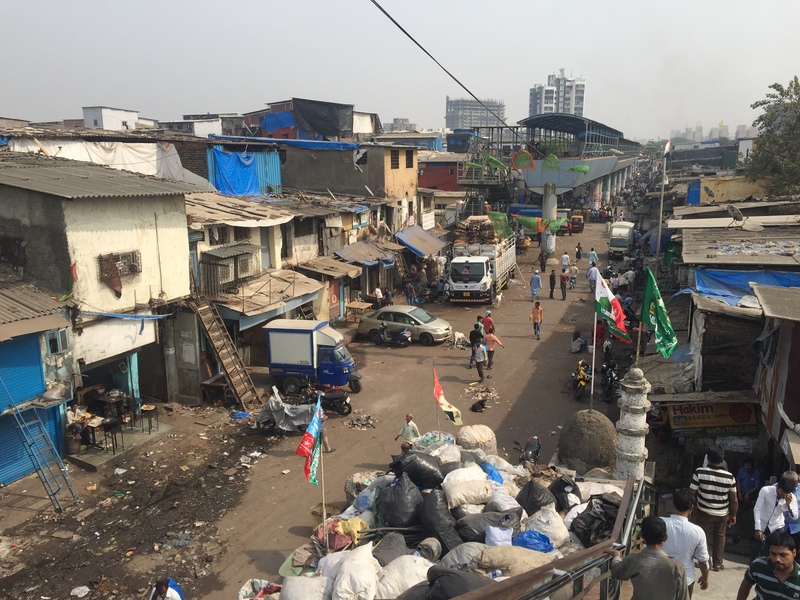 On day one of our CERES Global Sustainable Development, Permanent Culture and Un-learning tour to India we walked the Dharavi community in Mumbai, hosted by guides from Reality Tours. 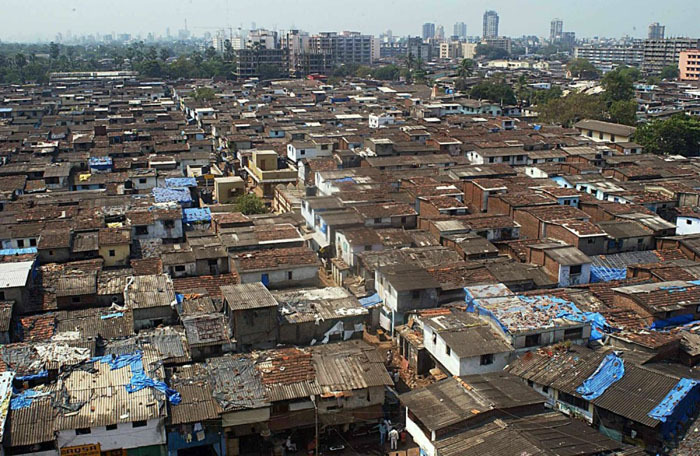 Dharavi is one of the largest slum colonies in Asia and home to over 1 million inhabitants. Although incredibly poor, Dharavi is also an industrious and vibrant place, sometimes called the “beating heart of Mumbai.” On our walk we discovered a vibrant community ecosystem flourishing in the midst environmental toxicity, highlighting the plight of Dharavi within unjust patterns of economic production and pollution, offering a glimpse into the chaotic beauty and nuances of slum life, as well as the challenges and struggles of informal and unplanned spaces in the slum environment. Walking through the diverse neighbourhoods of the Dharavi community, one sees a vibrant social ecosystem of co-existing living and working environments. It is an integrated community where residential, commercial and productive activities are closely integrated with place. Dharavi is divided into diverse neighbourhoods according to productive activities and migrant populations. Many of the residents of Dharavi hail from other parts of India, lured to Mumbai by the opportunity for cash income and the promise of a better life. Productive specialties range from plastics recycling and tanning to clay pot manufacture. This is such a contrast to suburban Australia, where residents are compelled to commute sometimes long distances to their places of work. There are pro’s and con’s to the spatial arrangement of suburban living. On the one hand, residential living is insulated from the hustle and bustle of commercial activity and the toxicity of industry. On the other hand, Australian suburbia is a productive wasteland, a black hole of resource consumption and a creative void in which neighbours are disconnected from each other because their livelihoods, and by extension their social lives, often exist elsewhere from where they live. Comfort kills creativity because comfort reduces the need for people to experiment with alternatives and substitutions out of necessity. The entrepreneurial diversity and creativity on display in Dharavi is a product of the existential challenges which Dharavi residents face in trying to make a living. While the social ecosystem is vibrant, Dharavi is nonetheless a heavily polluted environment due to the limited sanitation infrastructure and the dirty industries that take place there. In that sense, environmental concerns for Dharavi residents are very local and very immediate. As in other slum communities around the world, the “pollution of poverty” of the type we see in Dharavi stems from under-development and its accompanying lack of sanitation and clean drinking water, inadequate house, malnutrition and disease. Toxicity and safety become necessary trade-offs for the need to secure incomes. Significantly, Dharavi also illustrates the stark injustice of environmental politics. The extraordinary recycling enterprises flourishing in Dharavi are made possible by the accumulation of waste from the consumption activities of the wealthier classes. It is a sad fact around the world that the people least responsible for environmental pollution are the ones most at risk from the associated environmental harms. Our guides noted that there is now full education available to the children of Dharavi. A demographic bulge of educated young people with limited socio-economic opportunity could represent a looming political issue for greater Mumbai. As we saw in the 2011 Arab Spring across the Middle East and North Africa, an educated and politicised mass of young people, under the right conditions, can be the vanguard of significant social and political change. The harsh living conditions faced by residents of the industrial slums of Europe and North America helped to drive the politicisation of those populations and eventually led to environmental protections and pollution controls that radically improved the livability of those cities. We may yet see similar political developments evolve in communities like Dharavi across Asia. Looking out onto Dharavi’s major commercial street. Photo: Ben Habib. CERES Global is a project within CERES Community Environment Park aiming to engage with the issue of global inequities and the well‐being of all people on the planet and the environments in which they live. It has a special focus on working with communities to find solutions to environmental and climate change challenges. It also works to improve economic and social sustainability within these communities. CERES Global return annually to each of the communities we visit, building rapport and friendship in order that we might work together in the future to overcome environmental and social challenges. ***NOTE: The views expressed in this posting are my own and don’t reflect the institutional position of CERES Global or La Trobe University.